Today's new features include a new Alternate Shot game format, Concede Hole and Putt for Match Play games and new virtual equipment! We've been having a blast at WGT playing our new Alternate Shot game! 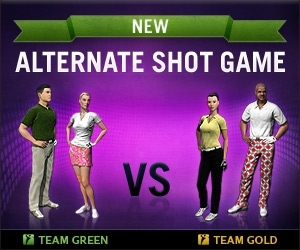 Alternate Shot is a new fast-paced four-player golf game where two teams compete against each other, taking turns hitting each shot, from drive to final putt. Alternate Shot is available in 9 or 18-hole stroke play games on Bethpage, Kiawah, Oakmont or St Andrews. Just visit WGT to create an Alternate Shot game and invite your friends, or find a game with new friends, and be sure to set your status to "ready for a game" so people can easily find you. Add Friends Add friends during a game by clicking + next to a player's name. Adding friends makes it easier to find multi-player, match play, blitz and alternate shot games. Concede Putt A new option to give another player their putt in match play and move on to the next hole. Concede Hole A new option to end a hole that you're losing to help speed-up match play games. Holiday Ball The perfect gift for your WGT friends! A festive red ball with a tinsel-green vapor trail. Based on our popular GI-SD Vapor Trail balls. Special Edition. Limited time only. See the balls! XP Ultra Boost This new virtual drink gives you 40% more Experience Points (XP) to help you level-up faster and unlock more virtual equipment. See the Ultra Boost! Ping K15 Clubs The newest PING K15 clubs use the latest technology from PING that lowers the club head weight for higher shot trajectory and distance. Unlocked at Level 37. See the clubs! We have scheduled downtime starting at 11pm PDT tonight, December 13th, for product updates. This downtime will last approximately 4 hours. A list of changes will be posted after the release on the WGT News blog. WGT on TV this Weekend! ADT is running TV ads on NBC this weekend during Tiger Wood’s Chevron World Championship, promoting the ADT Pulse Challenge on World Golf Tour. Here’s the TV commercial that you’ll see as you watch Tiger Woods battle Graeme McDowell and Rory McIllroy and 15 other top pros. Be sure to play in the ADT Pulse Challenge on WGT. It's free to enter and there's a sweepstakes prize for a trip for 2 to the ADT Skills Challenge at the Breakers Resort in Florida in November 2011. This amazing golf prize includes airfare, hotel, reception, dinner, VIP passes to the tournament and taping - plus the option to actually play in the ADT Pro-Am before the tournament. Wow!